Proponents of global ethics frameworks seek to identify universally applicable, knowable and enforceable moral obligations and standards. Many of these are grounded in particular conceptions of human rights and seek to secure positive obligations to respect such rights. In bioethics there has been a special emphasis on global ethics. 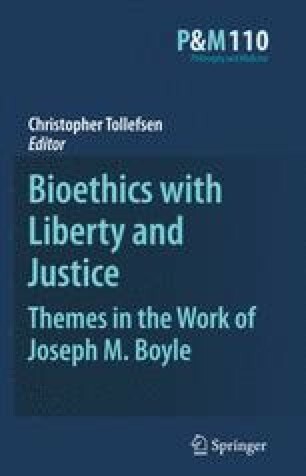 This is reflected in declarations and codes of ethics (World Medical Association, 1975, 1983, 1989, 1996, 2000, 2002, and 2004; UNESCO, 2005; Council of Europe, 1997) as well as in the bioethics literature, where some have challenged the plausibility of a global bioethics (Engelhardt, 2005; Cherry, 2002). UNESCO 2005. Universal declaration on bioethics and Human Rights. http://portal.unesco.org/en/ev.php-URL_ID=31058&URL_;DO=DO_TOPIC&_SECTION=201.html (Accessed July 5, 2007). World Medical Association 1975, 1983, 1989, 1996, 2000, 2002, and 2004. Declaration of Helsinki. http://www.wma.net/e/policy/b3.htm. (Accessed July 5, 2007).